I'm over our teenie kitchen. Yes, it's cute...or quaint...or whatever charming word you want to use to disguise it's cramped, inefficient boundaries. And I will miss it...it's inevitable...because it really is cute and quaint and sunny and warm. But I need elbow room. 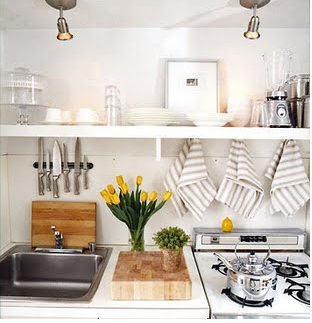 I need to spread out and make a mess when I cook (on a non-miniature stovetop, please). And clean it up easily (aka a dishwasher...like, a real electric one...), and store all of my cookware so it doesn't take me seven minutes to retrieve the one pyrex I need from the bottom of the pile. 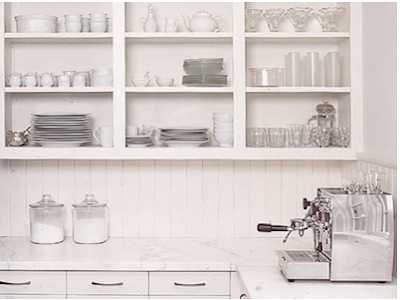 Yes...I love our teenie kitchen, but at the same time, I am over our teenie kitchen. So, what do you think? 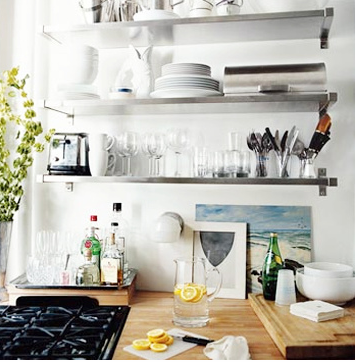 Open shelving--would you do it? It used to be no question--I absolutely would. How nice and convenient it would be to have everything right there in the open, at eyesight and arm's reach whenever you need it. It's certainly functional. 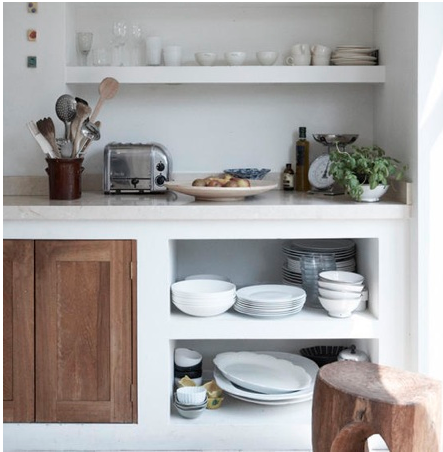 It gives you the ease and efficiency of a chef's kitchen with the cozy warmth of displaying your coveted kitchen things (quoted from the hubby, I might add). 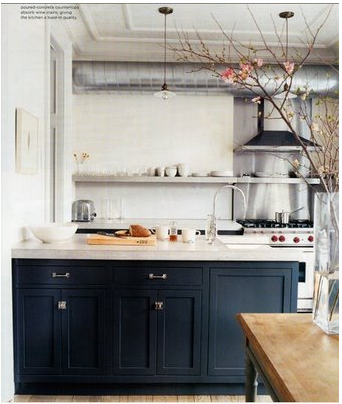 But now I find myself gravitating toward a sleeker look...wanting to disguise everything behind crisp cabinets. But, there's a lack of warmth and personality in that method. And, I do kind of love the kitchenware we have. I wouldn't mind seeing it on display...beckoning me to contrive some delectable recipe with it all. So, that brings be back to the question of the hour (or the day). 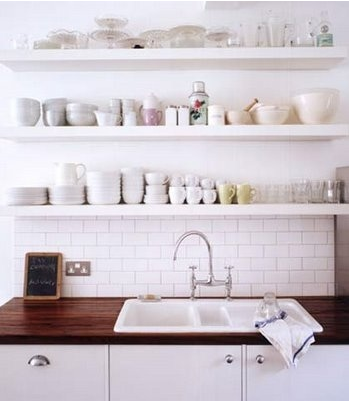 Open shelving: what do you think? Would you do it? Have you done it? P.S. winter in Charleston is so entertaining. It rained this morning, and it happens to be 35 degrees, so work has been delayed for hours. They are out and about sanding (not salting) the rainy roads. Because there might just be a patch of ice somewhere. I take it back. We are totally having an ice storm. Work has been called off for the hubby, and I won't be going in til later (if at all). You know what this means: SNOW DAY!!!!! LOVEEEEEEEE kitchens! - favorite room well other then bathrooms! 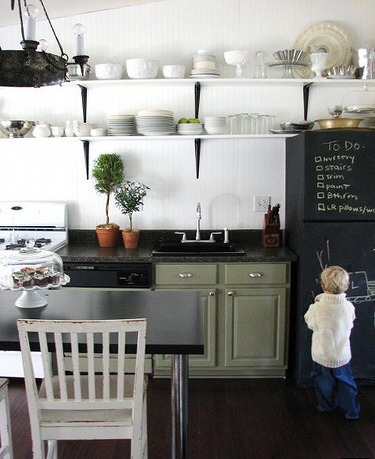 - open shelving is tricky! ugh! i feel you girl! i have officially ran out of kitchen space-i took an hour to organize my pots and pans the other day, not to mention the dish rags, pyrex dishes, etc. its one of my THREE cabinets! i'm so sick of storing stuff in my stove...if only i had another 500 per month to spend to get a real kitchen, instead of a hallway. that's a tough question! i personally like both. i want open shelves for certain items that look good together, are used often, & are somewhat matching. idk. it's a hard decision. go for it, if you have the wall space. i have all my pots & pans on hooks since we have very little space! Bea: I'm so with you. I'm pretty sure our kitchens are very much the same size: impossibly small. SO ready for a bigger one. Not to mention countertops that aren't peeling apart.